If you’re looking for a good bespoke suit in London, there aren’t many English options between £1000 and £3000 or so. Most are closer to the £1000 make and finish, but simply charge twice as much. An interesting option is to have the bespoke cut and finish, but with some parts of the work done abroad. Having one or two of the fittings done in China or India makes a huge difference to the cost, even with the distances the suit will travel. Kilgour tried this several years ago, but suffered rather from the PR of making in China. That was a shame, because the results were good. Recently a few others have started using a single workshop in China, which also seems to be going well. I will be trying out some of these over the next few months, as I hope they could offer a good option for someone trying to step up to high-end bespoke, but afraid of the tripling in price. For clarity and consistency, I will refer to this service as ‘foreign bespoke’. In this post we will be looking at Whitcomb & Shaftesbury. Despite the name, W&S is run by two Indian brothers, Suresh (above) and Mahesh Ramakrishnan. They have a nice room on the top of 11 St George St (the same building as Steven Hitchcock, on the ground floor). Their cutter is John McCabe (pictured top), who has been cutting around Savile Row for 40 years – at J. Dege & Sons and at Kilgour from 1993 to 2010. Suresh manages most of the operations in London, and is effectively front of house. 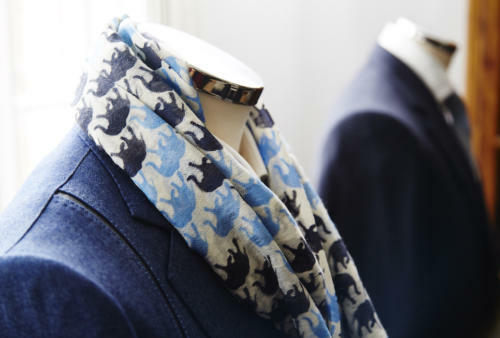 Importantly, he offers two services – both with John cutting, but one where the suit is entirely made in London with standard tailors, and the other where most is made in the brothers’ workshop in India. In my experience this is important because over time it brings the two offerings closer together. The same cutting is going into each, and you expect the same coat-making to come back. At every stage, John is comparing the work of both local and foreign makers and bringing them to the same standard. 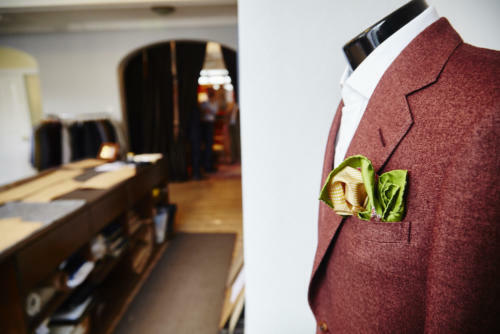 The two offerings are referred to as Savile Row Bespoke and Classic Bespoke, and cost £3040 and £1360 respectively (both exclusive of VAT). It’s quite a cost saving; and given that I’ve always said the fit is the most important thing, it makes the latter a great introductory option. I try to be cold and objective about these things, but it might also matter that Suresh and Mahesh’s workshop was set up in the wake of the 2004 tsunami, in order to offer training and work to fishermen that had lost their livelihoods. Since 2009, it has turned to helping abused and deprived women. Around 300 people have been trained in that time, of which 70 work there today. From what I’ve seen so far, the craftsmanship is on the same level as London. Indeed, the women in India are often able to take on things that some coatmakers would not, such as lapped seams and embroidery. One jacket (below) features two strips of leather embedded down the front of a jacket. It’s not really my taste, and the work wasn’t perfect, but that kind of range enables Suresh to offer unusual details and very low prices. 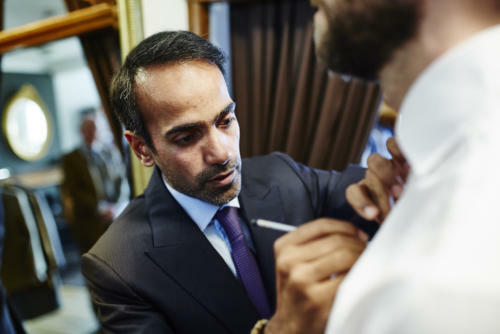 I was going to have one suit made in the Classic Bespoke, but Suresh offered to make me the Savile Row level as well, in order to compare the workmanship in each. It will be interesting to see how they turn out. You can follow the discussion on Whitcomb & Shaftesbury – foreign bespoke by entering your email address in the box below. You will then receive an email every time a new comment is added. These will also contain a link to a page where you can stop the alerts, and remove all of your related data from the site. Looks like a good concept, but I don’t really get why they wouldn’t use their ‘own’ names as opposed to a fictitious one? At one point I was expecting to read they had bought out an ailing firm, which is normally the case with such things. I have absolutely no doubt an Indian or Chinese (or insert other) based national could do just as good a job as a Savile Row tailor, but something about the naming thing always rings alarm bells when companies do this sort of thing. Like the ‘Savile Row Company’ of America which sells cheap shirts to unsuspecting Americans. Surely better to just call it by their own surnames or similar combination? J – quite right. I spent several years genuinely convinced that Aquascutum’s heritage dated back to 75 AD, in the belief that they were behind some of the first water-repellent togas in Ancient Rome. Words cannot express the disappointment I felt upon learning that the brand was merely created less than two centuries ago. John McCabe cut some suits for me at Carr Son and Woor many years ago. I will be interested to hear how this experiment turns out as if the quality of both are very similar I may try them. Very good topic you’ve opened with this article. Like many who read your blog with a limited budget I think this sort of venture by Whitcomb & Shaftesbury will be of great interest. I agree with J , why the ‘hiding’ behind the name, only has this is the thing often associated with Far East Tailors selling a Saville ‘Rowesque’ service. I note that Thomas Mahon (English Cut) was also going to start a similar venture. Maybe a comparison with that is in order ? In addition , with more and more offshoring of manufacture (e.g. Grenson Shoes etc) , beyond the patriotic argument does it really matter if the stitching is done in the UK or India or China ? Especially when affordability is a major criteria. Really looking forward to hearing your no holds barred style of review on this . No, as I’ve always argued I don’t think it matters where something is made. Purely the quality. Or at the very least, the two factors should never be conflated. Good question Colin. One for another post I think. Thank you for taking this project on, Simon. I think you have a difficult job on the blog in maintaining a focus on true craft and luxury while not completely alienating people (like me) who can’t afford some of the more expensive bespoke options. It’s difficult to find reviews/opinions of these services from people with enough experience of bespoke quality to offer an informed view, and yet intuitively this seems like it should be the value sweet-spot for men of more modest means. Thanks again, and I’m looking forward to your reviews. Am a huge fan of this site, and like and value’s Simon’s opinion, but I’m not sure he needs thanks for ‘taking’ a project ‘on’ that gets him £5K worth of quality clothing….. Even if it is selfless of him to do this. Haha. Naturally, I look forward to reading Simon’s take on the company….. Absolutely Richard, it’s a wonderful job. To be clear though, I approached W&S to pay for a suit to try. And I am still paying for one of them. Was only teasing the poster, Simon. Not you. Really enjoy reading you. Best commentator online on this subject. Hmm, I wonder if any of these 70 Indian women ever will be able to buy their own products? If you say that does not matter, then I wonder what kind of relationship these women ever get to the products they make? Compare that to the interacting world of cutters and tailors (even those working from home) in London, then one must conclude there is very little bespoke about it. Foreign bespoke? No sir, from a customer’s point of view this operation is all about making more profit and the idea of bespoke is corrupted. If only the quality matters, then I’d say the working conditions of these women do to. After all, that is why “real bespoke” is so expensive. I think you’re confusing a few points there Frank. 1 – Just because it’s being made in India, it doesn’t mean the profit is any higher. The price is half as much. 2 – The vast majority of people who work in bespoke or luxury cannot afford the products they make. This is no different. 3 – Real bespoke is not more expensive because people have better working conditions. It is more expensive because of the costs of living and retailing in the UK. I have no basis for a discussion of whether these women have better working conditions than a tailor in the UK, and neither do you. Indian bespoke tailors in Dubai charge about 800 to 1000 GBP for bespoke suitssuits, would love to hear if you have experience with them? Or heard reviews? I look forward to your experience with this; I agree that there is no inherent reason that a suit made in Location A should be superior to one made in Location B. It all comes down to the quality of the work and the way the process is set up. I think there are challenges that distant production creates, but those challenges should be manageable if properly addressed. Also, remember that many (most?) London bespoke firms use outworkers, which approach creates its own challenges. It sounds like the Indian production may be under one roof, which has benefits in terms of quality control, process efficiency, and perhaps process improvement/learning. Simon — one nit to pick: you continue to use the words ‘that’ and ‘which’ to refer to people, whereas ‘who’ and ‘whom’ is appropriate. For example, in this piece, “… of which 70 work there today …” Based on a bit of Googling, which should not refer to people. The use of ‘that’ in reference to people apparently is grammatically acceptable but is jarring to my (overly sensitive?) ears. Absolutely on location. The key difference is the scale that goes from in-house coatmaker, to out-work coatmaker that the same cutter uses all the time, to a new or rarely used coatmaket. It’s all about experience and familiarity, which is why so many MTM systems don’t work. This is under one roof, yes, and there are regular visits from the master coatmaker here in London. Thanks very much for a wonderful website,i love it. I have just purchased some light grey Flannel trousers from Ralph Lauren and was wondering what your advice would be,as to whether i should have a turn up or not and if so what depth? These will mostly be worn with Edward Greens and possibly some Sanders Hi tops. Perhaps I’m being overly sentimental but I imagine the same type of relationship is harder to achieve with this type of outsourcing arrangement, and this in turn might affect the quality of the final product? It can do, yes. Hence my point earlier about communication and training. That is by far and away the most important thing. Sounds very similar to Cad & the Dandy and my experience of their output has been decidedly mixed. I’ll be interested to see how this one works out. As for the reader who mentioned Thomas Mahon – I would caution against using his newly launched online M2M as you’re unlikely to see your suits for several months, if it all. I ended up demanding a refund after waiting over 9 months for a first fitting. Total disaster. Hello again, Simon. I always look forward to your posts. Given the exorbitant cost of bespoke tailoring (even $2700 USD is a princely sum), I don’t understand why people don’t research (and personally experience) RTW and OTR makers. Given enough experimentation, one will inevitably find the right “block” for their body type. I could be the “fit model” for two Italian brands (for instance). In reference to posters who say this “foreign bespoke” is helpful for the budget conscious man…I do quite well for myself, and I must tell you that $2700 USD is hardly fitting into my budget. I would rather buy from an ebay seller like Sartoriale, who offer new, unworn suits, take them to my tailor, and I have the perfectly fitted suit (again – it’s two makers for me that – essentially – have the ideal block/pattern). Their suits are almost always under 500 pounds (1K USD), and the handwork and craftsmanship is second to few. It’s one thing to want quality and great fit, it’s another thing to pay a third of your monthly salary to get there. Moreover, a bespoke suit often does not last – especially if rendered in cashmere or flannel. You’re lucky to get 2 – 3 years out of the garment. And – at those prices – it’s a losing proposition when you have so many wonderful OTR options. I’m afraid most people on here will disagree with you Wes. That of course is without going into the many other quality points of bespoke versus all the suits you are discussing (aesthetic, eg hand-sewn buttonholes, and practical, eg hand-inserted sleeve). 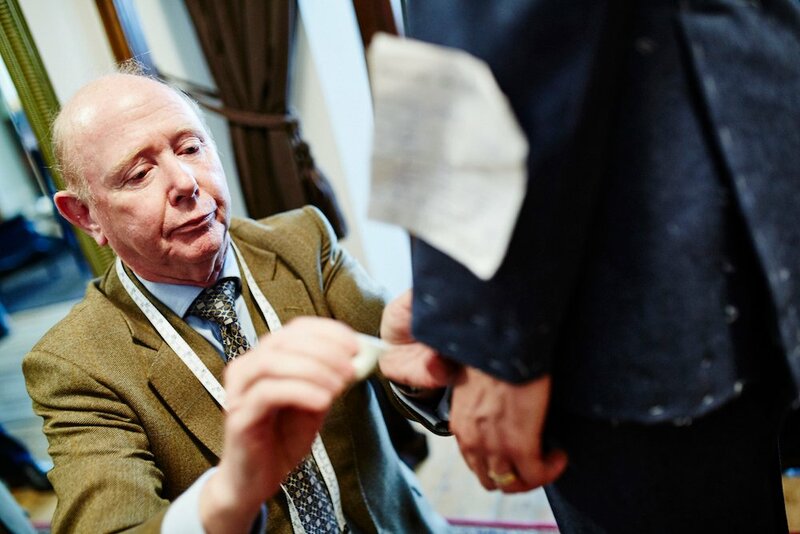 And of course a bespoke suit can last just as long as a ready-made one given the right materials, and usually a lot longer given the quality of the work. I would always encourage people to have their RTW suits altered, but I’m afraid it will never be bespoke. Simon is correct. It will never match bespoke. Regarding what it’s worth, I once had to endure a never ending lecture about the cost of my shoes from a friend who has a garage full of cars he never drives (his wife loved my shoes and asked the price and I made the mistake of telling her). Everybody has their thing and their limits. Self imposed or otherwise. Personally, I’d rather have a few well made items that I love and which I wear regularly than a wardrobe full of average stuff. I’m no fan of consumertitus but for me bespoke is something that I love and appreciate. Dear Simon – Thank you for this post. I’ll await your comments. I wonder what you think about their process with overseas visits? If the suits they make you meet your criteria/expectations, should we think that the end result would be similar if we have them make a suit during a visit to the US? Thanks for this post, Simon. 1. To answer J on why they used a different compared to their original ones- the surnames are Ramakrishnan (and mine is equally long coming from Chennai,too!). With such long names as ours, the cost to put it on the suit would be higher than the suit itself! Jokes apart, but guess they must have their own reasons. 2. I know where their suit-making unit in Chennai is, and it is NOT in one of the “sneeze-and-it’ll-fall” spots. So the working conditions are akin to what you’d experience in London. On a side note, this is a really great initiative of 2 brothers (one an ex-banker and the other an ex-management consultant) to actually make a difference. So for now, I will applaud them and get back to work, in order to be able afford their offerings (among the multiple other stupendously beautiful things Simon educates us on). This is interesting and the outcome will be fascinating. That said, I prefer — whenever possible — to buy products made in the UK. Failing that , Italy gets the rest of my sartorial dollars. I agree it is a pity that they are using a generic sounding name & don’t feel able to use their own names or something that represents them more authentically. Simon apologies if you have covered this before but could you expand on your point about the 3D nature of bespoke? Thanks. Hi Simon – looking forward to seeing how your suits progress. Some years ago I had two suits made by Kilgour in China – one of which was cut by John McCabe. Both were great but unwearable now as I was a bigger man back then. Simon I have used this service from W & S and was not disappointed. Initially I was shown examples of both Bespokes without knowing which was which and asked if I could detect any quality differences between the UK and Indian made versions. I could not and therefore went for the less expensive option for my commision. It turned out to be perfect. Would you be willing to name any of the London-based tailors who you would classify on this basis? I appreciate that you have previously indicated a reluctance to criticise, but I – and I’m sure other readers – would be interested to know which tailors you don’t think provide value for money. How would you describe the construction of their house style? From the photos it perhaps looks a little more structured than what you would normally go for. Simon, thanks for this article – very interesting. As always with this topic there is great interest in quality RTW & MTM. I think, with readers help perhaps, that it might be a good project to coordinate a list of tailors outside of SR. 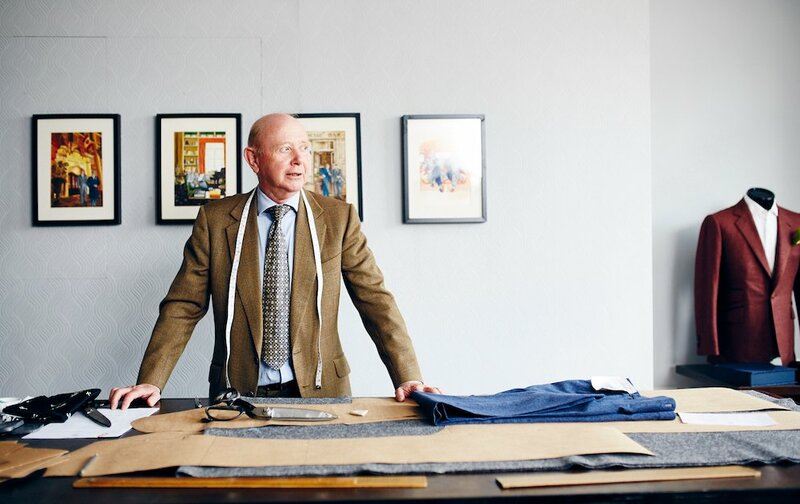 There are also many good bespoke tailors across the UK that might be worthy of consideration. Michelsberg in Leeds comes to mind as an example where quality (from reviews) seems high but at a similar price to that of Graham Browne. Just a thought but it might prove to be greatly useful for readers. Thanks, yes that’s a good idea. I try to only review tailors that I have actually tried myself, mostly for consistency and comparison. It’s obviously a little unreliable when lots of people are giving their feedback, form varying levels of experience. But as long as that is understood it would be useful. Good idea and something which certainly would be useful for those of us who don’t spend much time down south. P.S. Michelsberg in Leeds is to be avoided. He has a flashy website and good online presence but he’s no tailor. His suits are all made by Carl Stuart in Ossett. Order from him and you’re paying an extra £300 – £500 for the privilege of having your measurements taken in a swanky shop in the Victoria Quarter. One thing I keep picking up on in this article is the fact you say most london tailors give you a £1000 but just charge more. As you know I am just about to have my first consultation in the next few weeks for my first bespoke suit. I did debate for ages between tailors. I couldn’t decide if it it was worthwhile going to someone like sweeneys, Everest, Powell etc or just giving graham browne a go. I decided to go to stay away from the city in the end but now you have me questioning my choice…again! It’s absolutely not true to say that you get the same quality suit, whether made in India or London. I’ve seen both versions. The Indian-made version offers a cheaper alternative if price is your God. It’s not even close to the London-made option in quality. The London-made option is not simply a more pricey version of the same thing. It’s bona fide bespoke from a top-drawer cutter and made by SR craftsmen. Are you talking specifically about the W&S offering here? Both are cut by the same person, and from what I’ve seen, the tailoring work is pretty much exactly the same. Simon Anonymous must be a very astute tailoring expert if he could spot £1600 worth of quality difference in the two W & S suits cut by John. I live in the Netherlands, and there basically aren’t any bespoke tailors here as far as I can tell. I suppose I could travel to London, but I would much rather like to make an appointment with a travelling tailor in Amsterdam. Could you recommend someone? I shall write about Bauer, the Swedish tailor, soon, and I believe he (Fredrik) travels to the Netherlands. Sorry if this is the wrong thread but is any one as appalled as I am at how awful Daniel Craig looked in his Tom Ford getup? I heard Mr Ford paid a certain consideration ($7 million?) for the right to dress Mr Craig and, well, so be it. But this “skinny boy” look while sharp to the majority of the average viewer felt a betrayal of all that Bond stands for, viz., The Best of British. And those shirt collars? I know that this sort of filmmaking is a commercial venture but I did fell a little sorry that he couldn’t have looked a little more Mallory (M) or Kingsman. I was wondering if you had a view on opening hours? I know no one wants to work weekends etc but I would have thought most those considering bespoke suits work themselves and probably in the types of jobs that are typically “mon-fri, 9-5”. Whilst a few SR tailors are open Saturday mornings many arent, including W&S, and so they’re limiting themselves to those who work within 15 minutes of the shop. There are a couple of tailors I’d like to try, including W&S, but being ~1hr15 round trip from Canary Wharf before factoring in waiting time/fitting time etc and the 2hr lunch is something of the past in my industry I simply cannot use these companies. Do they have so much business they don’t need to consider those outside W1 or the independently wealthy? Not sure if you’ve done a review of Cad & the Dandy, but do you have any comments/thoughts on their fully bespoke offering (which in some cases appears to be in the price range of the Classic Bespoke offering by W&S)? Would you recommend WnS for a sports jacket( something like a blue flannel) or is it better to go for a formal 2 piece suit as a first? Thanks Simon, so you would recommend something like worsted wool or cashmere? A friend of mine and I recently had a classic bespoke suite made at W&S. Quite to our surprise, the 1st fitting suits were, for the two of us, not made with the fabric we picked, but with a cheaper cloth, not at all the kind of picture we could see in this article, or others on this blog. Since it was our first bespoke experience, is that normal procedure? Thanks, that’s interesting to know. I didn’t have that experience, but it is something tailors will sometimes do, when they want to get a better idea of fit before working on the final cloth. I wouldn’t worry about it, but perhaps ask why.